The shoulder capsule becomes inflamed and starts to shrink causing limitation in shoulder movements. This condition is very painful and can cause a lot of disruption. Daily activities such as brushing your teeth, feeding using your shoulder can become very painful. 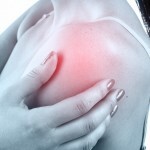 There is no exact reason why some people develop frozen shoulder. However, there is some research to suggest that 35-50 year old age groups are more prone. Those who have a history of shoulder trauma or surgery to the shoulder, suffering from diabetes, hyperthyroidism, autoimmune disease, inflammatory conditions, in activity of the shoulder are also more prone. Physiotherapy treatment for frozen shoulder depends on what stage you are in; Pain relieving techniques including gentle shoulder mobilisation, muscle releases, dry needling and kinesiology taping for pain-relief can assist during this painful inflammation phase. Shoulder joint mobilisation and stretches, muscle release techniques, dry needling and exercises to regain range and strength are useful for a prompt return to function during the Frozen stage. As the shoulder begins to thaw shoulder mobilisation and stretches are your best chance of a prompt return to full shoulder movement. As your range of motion increases your physiotherapist will be able to provide you with strengthening exercises to control and maintain your newly found range of movement.